If you have embarrassing jiggly arms and you don’t feel comfortable to wear sleeveless shirts, then you are not alone. These jiggly parts of your arms are called triceps. Your triceps are the large muscles at the back of your upper limb and are primarily responsible for straightening the arms. There are 2 main causes of flabby arms, the first one is age and the second is body fat. As we become older, our skin becomes saggier as it loses its elasticity. This is mainly noticeable in the upper parts of our hands. The problem is that there is not much we can do about it. As for the second cause – body fat – we can lose weight to reduce body fat including arm fat. If you are interested to lose weight and body fat then you should read my other articles: Amazing 9 Secrets of Losing Weight Without Diet and 12 Simple Tweaks for Weight Loss and Great Health. In addition to appropriate nutrition, you also need to tone your muscles by doing resistance exercises. They can also help you if you want to lose weight fast, for example losing 10 pounds in a week. These exercises can be done at home, and some of them require 1-2 kg hand weights (dumbbells) or heavier if you want. 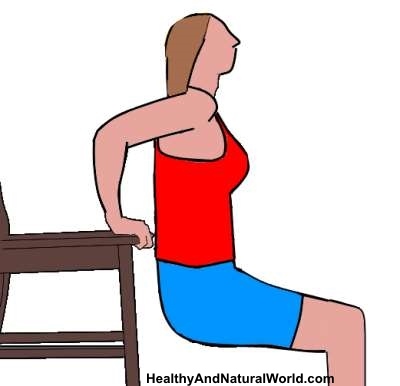 You will need a stable chair to perform this exercise. Place your hands shoulder-width apart on the chair, while your bum is in front of the chair. Your legs should be bent on the floor about hip-width and your back close to the chair. Now straighten out your arms but always keep the elbows slightly bent. 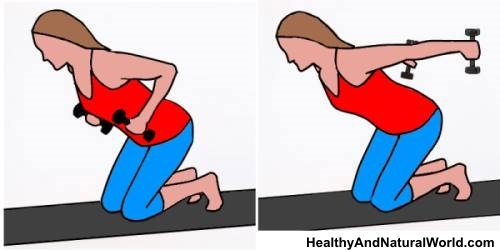 Then slowly bend your elbows and lower your body towards the floor until your arms are at about 90 degree angle (you will feel tension in the triceps) then press with your arms and push yourself back up to the starting position. Repeat 10-15 times. Get on the floor with your hands under your shoulders. Keep your elbows close to your side and then lower your body. Then return to starting position. If you find it too hard, change your starting position so that your knees are bent and touch the floor. Repeat 10-15 times. For this exercise you will need 1-2 kg weights. Hold your weights and get on the floor while your knees and toes touch the floor. Bend your upper body forward from the hips up and bend your elbows at 90 degree angle. Now extend both your arms backwards while your palms facing each other. Feel the tension in the triceps and return to the starting position. Do 3 sets of 8-10 repeats. You can do this exercise by standing or lying on the floor. You will also need 1-2 kg weights. Lye on your back and raise your arms above your chest. Keep your elbows slightly bent and not locked. Now bend your elbows at 90 degree so the weights reach the floor. Your elbows should be on either side of your head. Lift back to starting position. Repeat 15 times. Stand with knees soft and not locked. Straighten your arms while your elbows are next to your ears. Now bend your elbows at 90 degrees. Then squeeze your triceps to straighten your arms. Repeat 15 times. Place your feet shoulder-width apart. Bend your knees and bend your upper body forward from the hips up. Keep your spine neutral and don’t bend your lower back. Your hands should be straight under your shoulders. Now bend the elbows back while lifting your arms towards the sides of your chest (your shoulder blades should be pulled towards each other). Slowly lower the weights in a controlled movement and feel the tension at your triceps. Repeat 15 times. Lie on your left side while your knees are slightly bent. Put your left arm on your right shoulder. Then press your right palm into the floor until it’s straight and lift your upper body. Repeat 10 times, and switch sides. Is it possible to target specifically the arm fat? Unfortunately it is not possible to lose fat from a specific part of your body. Because flabby arms are often the result of weight gain, you should try to lose body weight to reduce the fatty layer of tissue in your arms. There are some specific ways to lose weight and prevent your body retaining too much fluid. These will not only help you to get rid of flabby arms, but they will also help to improve your overall health. To help you lose more fat from your arms, you should make some lifestyle changes to lose body weight and fat. 1. Cardio exercising. Cardiovascular exercises such as running, cycling, and swimming are great ways to lose arm fat fast. It will also boost your metabolism, which will also help you lose weight faster. 2. Eat healthily. Avoid processed foods, foods rich is saturated fats or refined sugar in large amounts to reduce fat around your arms, your upper body, around your belly, and on your thighs. You can try to consume probiotics to help with digestion, berries to boost your immune system, and drink green tea to help you lose weight. 3. Consume more fiber. You can help to get rid of fat arms by increasing fiber intake. Fiber helps to keep you feeling fuller for longer and reduces cravings. 4. Drink more fluids. Drinking plenty of fluids can help you lose arm fat by helping you lose weight naturally and prevent water retention. It will also help you avoid the damaging effects of dehydration. Instead of plain water you can drink ginger tea for weight loss or flat tummy water. J Am Soc Nephrol. 2008 Jun;19(6):1041-3. Clin Exp Hypertens A. 1987;9(7):1243-58. NIAAA. Alcohol’s impact on kidney function. WebMD. Moderate drinking linked to weight control. I’m definitely going to try these! I’m sooo paranoid about my flabby arms!Thankyou. . So sad to lose your beautiful boys it breaks my heart. My sons are every thing to me. They must have grown up feeling so loved by you. Hey Tanya, did these exercises work? How long before one sees results. Thanks. It is very useful and good information. Great work on health related issues awareness keep it up and thanks. Thanks for such a useful information! i’ve been looking for these tips! thank you!! Thank you for adding more of what ive doing, it’s raelly helpful. aaah,but do they really work?Anyone tried these and sucsessfully got rid of them?…would really like to know. Have you ever watched the Olympic swimmers B4 they go in the water? They shake their arms and their upper arms jiggle a lot! These are girls who are not just fit, but muscular! U cant really get rid of the fat arms..but ofcrse u can tone dem…nd dey do wrk..I ve been dng few like d dips, pushback nd extensions.,. These are great exercises for toning the triceps, but they will not get rid of “jiggly” arms. It’s a trifecta to reduce “jiggly” arms: to reduce the “jiggle” in one’s arms, one needs to add cardio and a diet with plenty of protein, high fiber and very little sugar to the mix along with these resistance exercises help build lean muscle mass to improve metabolism. 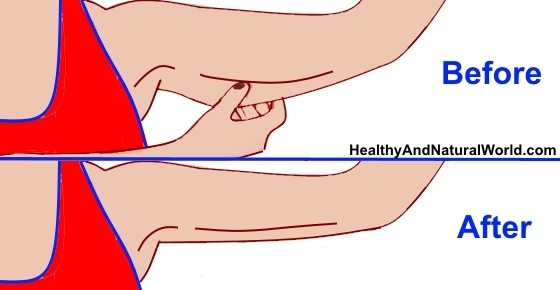 This is what gets rid of “jiggly” arms (or reduces it). Well said Jennifer and so true. These exercises will not work. Jennifer is right. Cardio (burning body fat) is your answer. In some cases for smaller women, you can sorta fill in this jiggle with a little muscle but i know from experience that if you’re overweight, you simply have to burn it off. Try sweat bands also. I’m talking about those wraps you use on your tummy. They have them for thighs and arms and do work but you have to keep up a healthy diet and routine to keep up the look. I personally find it hard to believe they made your arms bigger. Women don’t develop muscles like man do, and these exercises don’t use big weights. These exercises tone the area rather than made it bulky and big. I’ve done these exercises for a long time, along with cardio, and got great results. Exercise and diet always goes together, I’ll do combinations that will compensate each other. If I am sticking to vegetarian diet, purin free, lactose free foods, where do I get enough protein rich food to compensate meat products? Would appreciate so much if I get some useful tips here!Thanks for your very useful tips! Thanks for posting! I am starting these exercises NOW! 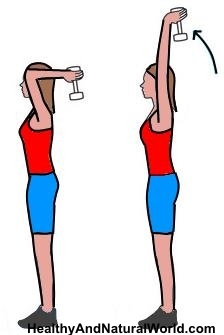 I’ve been looking for exercises to work off these flabby arms!!! Love your site!!! I think all of your posts are very relevant and helpful. I would love to get your newsletters so I may improve myself in many areas. these exercises are v useful. n it helped me alot. thank you and keep it up! truth is, until the fat comes off, no one will see your tricep. Do all the exercises you want. It isn’t the tricep, it’s fat. All my life I’ve had fat jiggly just huge arms. And I’m 22 now and sick and tired of it. I feel like its the only thing people look at when I show them off. I look and the mirror and most of the time start crying. I tell myself how much I hate myself for letting myself get this way but its always been that way since I can remember. Like why is all my fat going straight to my arms I don’t freaken get it I’m not an fat person. I might be a little overweight but people tell me Im tiny. WHY DID GOD DO THIS TO ME..?? Cheer up! All is well. You are young, so therefore getting rid of the “jiggly arms” should not be as challenging for you. Your body shape is yours, so be proud of it. If you have naturally big arms, which some of us do, then begin to embrace them. If the excess weight on your arms is due to poor eating habits and lack of exercise on your part, then make some changes. First, start where you are. Feeling sick and tired of it can be a motivator and great starting place to do something about it. Second, look at your diet. I find that when I eat carbs such as bread, pasta, or anything with white flour, I noticed a change or feel a change in certain parts of my body, my arms and thighs. This is also true with sugar consumption. If you are a fan of the above foods, try avoiding them. Third, exercise always help to get fid of body fat. Cardio will help such as aerobics, swimming, walking, or any exercise that requires movement in your arms. The tips given on this page are excellent along with the cardio. You will see the results in no time. I know because I did it. Lastly, begin to take notice of the foods you eat and how your body responds to them. Remember, you are beautiful as you are, and wonderfully and fearfully made by God. You are one of a kind. I will have to respectfully disagree with you on carbs. Refined starches like white flour and white pasta should be avoided. However starches are VERY healthy. I am doing a vegan, low fat, starch based diet (Starch Solution). I have lost 50 pounds so far. I am MUCH healthier than I used to be. For more information on starch based diets go on youtube and look up “Starch SOlution”. Go look at one of the 1 hour presentations given by Dr.John McDougall. I don’t agree with him 100%; but the basic idea behind his diet is spot on. I disagree. Women don’t develop muscles like man do. Doing triceps exercise along with healthy nutrition and cardio will help to tone the area. It will not build muscles that will make your arms look bigger (at least from my personal experience). These look like great exercises. Has anyone done them for a while, and can you share your experience or results? Hi Ainee, I’m not really sure – perhaps some of them are suitable while others are not. Any exercise that causes you back pain or uncomfortable feeling is probably not good for you. The best thing is to consult with a doctor or a physiotherapist to be on the safe side of things. You don’t want any further damage to your spine. Is it effective to do it widout dumbbells ? Doing the exercises without dumbbells reduces their efficacy as the weight helps to improve muscle tone. You can re-purpose ordinary items at home to replace the dumbbells, for example, use canned goods from the pantry or water/milk bottles or other similar-sized filled plastic bottles as dumbbells. By the way, can I just do one of the six exercises? Is it alright ? Because I need to get rid of my embarrassing arms as soon as possible am tired!!! Hi Anna, you don’t have to do all the exercises. You can do just some of them and alternate between them for more variety. Thanks Jenny…I have already started with water bottles for now while am waitng o purchase dumbbells!!! Thanks and blessings! Please don’t forget the main factor in reducing ‘jiggly’ arms is actually diet. 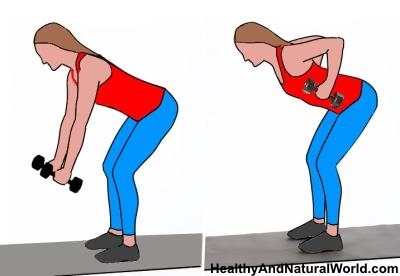 Doing triceps exercises will no doubt help as you are increasing the muscle mass but you won’t remove any ‘jiggle’ by just doing these exercises. Many people are genetically predisposed to store fat on their upper arms, the only way you are really going to reduce the fat is by diet and exercise (calorie reduction). It is a scientific fact that the body cannot spot reduce fat on the body, it could be the last place your body holds fat (most likely its the waist though). I would suggest looking into high protein (and good fat) with low carb diets. Another useful exercise (especially useful for people with mobility problems or don’t have much time/space) to try is to stand facing a wall, place both hands on the wall so you are leaning forward and slowly push off until your arms are fully extended (locking elbows out). Repeat (at least 8 times) until the muscle is starting to fatigue, try to do this set at least 3 times. Hope this helps.. I recommend staying away from low carb diets. I do a vegan, low fat, starch based diet (Starch Solution). I have lost 50 pounds so far and am loads healthier than I used to be. Starches are very healthy. Our cells run on glucose; which is what starch is made of. So give the body the fuel it runs on. For more info on starch based diets go on youtube and look up “Starch Solution”. Watch one of the hour long presentations by Dr.John McDougall. I had a girl friend that was on a bowling league, and within around 2 months her arms were two total different sizes. No dieting, or any other type of exercises. No low carb diets, just bowling a couple times a week. So yeah, if done right these exercises WILL work…. Hey, just a a quick question. For how many time a week of a day did u do it & how long did it take u to see the result ? I needed the extra exercises!! I’ve been doing the triceps one with chair or bench & it’s wonderful!! Great to have more than 1 exercise though! How many times per week should the exercises be done? You can do them 2-3 times a week. You don’t have to do all the exercises. You can do just some of them and alternate between them for more variety.